Such was apparently the go-to formula for this four-piece act from Philadelphia. Founded in 2014, the band has already made its mark with a number of live performances and independent records, including last year’s self-released Thousand Lives. For their debut full-length LP, however, Beaumont was determined to better polish her output. This demanded meticulous collaboration with bandmates Rob Dwyer (guitar), Will Schwartz (bass) and Zakary Iannitelli (drums), as well as producer Erik Wofford. Together, the group shifted from its native Philadelphia to their recording studio in Austin. Four or five demos would often be pounded out until each song satisfied the lot of them. Four or five demos would often be pounded out until each song satisfied the lot of them. The extra effort has paid off. Premiering today on Atwood Magazine, Hidalgo (officially out 9/15/2017) maintains a soothing, dream-like quality throughout, making it easy to drift away into the music. The guitar-playing is consistently first-rate, with especially impressive riffs surfacing on tracks “Better Off,” “Hidalgo” and “Regression.” Combined with the equally commendable drumming and bass-playing of Schwartz and Iannitelli, the music here is always engaging and brimming with character. One standout is the track “Rather Forget,” featuring guest musicians Christopher Cox and Matthew Shepherd — the percussion, bass and background vocals these two lend to the track strengthen an already effective composition. Hidalgo’s musical influences are far-flung. The Church Girls are professed admirers of David Bowie— the album echoes the famous weird-but-wonderful feeling of his music, and the opening lines from “Glass,” an overview of the troubles one encounters when attempting to “make small talk in a social situation,” draw upon “Breaking Glass” from 1977’s Low. Among the other chief influences Beaumont points to are Cake, St. Vincent, Television, The Police, Sleater-Kinney, Dirty Projectors, and Cloud Nothings— although she notes that “we each have different musical backgrounds, so finding common ground is difficult.” Nevertheless, by drawing upon so many distinct sounds, as well as working closely and single-mindedly in the studio together as intended, the group has fulfilled its goal of achieving its most sophisticated and refined sound to date. Thematically, Hidalgo is concerned with a wide variety of the trials of everyday life, from overcoming loneliness, to dealing with painful memories, to struggling to find a sense of purpose. Of course, such troubles can only intensify upon deciding to leave it all behind and take a shot at musical stardom. Among other things, such a lifestyle makes it difficult to maintain past relationships— Beaumont confesses that she’s had to “disavow from those I once called friends” as her career with the band has solidified. On the microphone, the Church Girls’ frontwoman yearns for a simpler time (“I liked it better when it was black and white”) before realizing that perhaps those past times were not always so pleasant (“I’ve seen some things I’d rather forget… I’m lost in ignorance.”) In the end, though, Beaumont resolves to carry on in spite of the challenges she faces— while recognizes that “the edges are bound to break when you’re hanging in a sticky place,” it is ultimately worthwhile to “keep hanging onto it all” and stay true to her longtime commitments. And this decision is clearly final— “there’s no bridges left, ‘cause we’ve burned them to the ground,” she sings. All of this makes for compelling narrative content. Church Girls has done a fine job encapsulating the trials that bands are known to go through when first getting off the ground. At this point, they are poised to keep on rising now that they seem to have achieved the collaborative sound they’ve been searching for and finally brought a full-length record to vinyl— “a longtime dream of mine,” Beaumont professes. 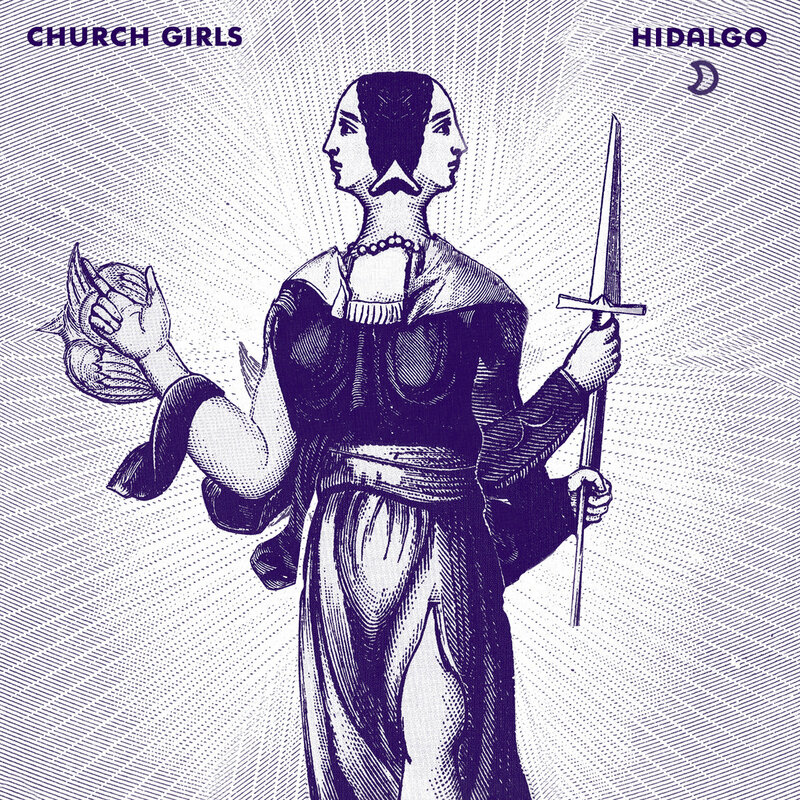 The group’s lead singer’s goals for the group are simple and grand: to “keep improving our live show, keep collaborating more and more on new songs, and keep connecting with as many fans as possible.” After the all-around success of the team effort that Hidalgo distinctly represents, all of these goals should be quite attainable for the Church Girls. Stream the full Hildalgo album below now, exclusively on Atwood Magazine!